The acquisition of Lexcycle by Amazon sure got all the digerati’s creative juices flowing. 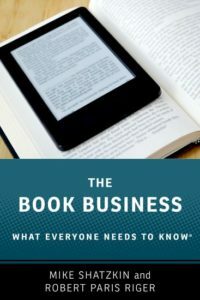 What is becoming increasingly clear is that general trade publishers have a card to play here that the niche publishers can only join in on: creating a collectively-owned ebook “store” that can provide an economic baseline for the emerging ebook marketplace. Michael Cairns suggests this possibility in his piece this morning. But his focus is on epub and interoperability standards. Mine is, and I believe the publishers’ will be, on pricing throughout the supply chain. Through laziness, thoughtlessness, carelessness, or inertia (or whatever combination thereof), the ebook supply chain has adopted discount structures that imitate the physical book supply chain. This is daft. There is no comparison between the retailers’ costs and risks associated with physical books and those associated with ebooks. There is no economic justification to providing the same level of discounts. But that’s where we are. Amazon may be arm-twisting to enforce this discount equivalence, but they didn’t think it up. It’s pretty much universal and it came from the publishers in the first place. As I suggested in my ebook post from London last week, now is the time to change this, before ebook revenues become too great. The college publishers with CourseSmart have mapped out the way to do something about this legally, but the play is pretty obvious. The publishers need to jointly fund and substantially own a virtual retailer whose mission would be to deliver all conceivable ebook formats (whether epub or not!) The store should be competitive with other offerings as to interoperability, lightness of DRM (I favor social only), and customer service. Establishing such a business would force publishers to figure out how much discount off retail is required to enable the retailer to be profitable. I suspect that number is about 20% and, at that level, would allow modest discounting (5% or 10%) on some titles to the consumer. To stay on the right side of the law, publishers would sell to the new entity on the same terms they sold to everybody else. But the objective here is to limit the ability of retailers to force higher discounts through boycotting publishers or titles with impunity. That is what his happening now. Sometimes the book you’re looking for now on Kindle isn’t there because the publisher won’t agree to Amazon’s discount schedule. I know specifically of one medium-sized trade house for which that is true and, if there’s one, there are probably more. If publishers don’t do this, the excessive discounts they offer retailers will turn into high standard discounts for consumers that will create inexorable downward price pressure. Amazon may be subsidizing that $9.99 price point they like, but the publishers are subsidizing it too. This idea can work because six publishers control the lion’s share of bestsellers, which is a big chunk of ebook sales in the short run. Bestsellers is the one “niche” in which the general trade houses have critical mass. And if this idea can work, another one waits in the wings. It has been bemoaned that Google and Amazon are on a path to control both discovery and delivery of books in the future. This isn’t even a particularly competitive situation between the two of them, since Google is much more interested in discovery and Amazon is much more interested in delivery. Because Google is more interested in discovery, they are also not particularly interested in books. They are about “all the world’s information”, not “all the world’s books.” So as robust as Google Book Search is, the company is not focused on making it a competitive book discovery tool compared to Amazon. They are about incorporating the book information to make a superior information discoverytool. That leaves another opening for publishers where the Big Six have a strong collective position: the metadataassociated with the biggest books. This initiative could solve a number of problems for the big publishers. It would create a “Switzerland” for enriched metadata: a place to make it available which would help all the online booksellers. To the extent that it grew in consumer acceptance, it would reduce the danger of being being buried or victimized by bad data on a retailer site (think of the recent brouhaha about the “adult” books on Amazon). It would enable the consumer to shop across many book retailers at the same time. And the referral fees the site could earn would reduce the degree to which it needed to be subsidized as a marketing expense. The current effort by several general trade publishers to drive traffic to their own house-branded web sites is misguided and doomed. But Amazon (and Shelfari, GoodReads, LibraryThing, and our new entrant, Filedby.com) have demonstrated that sites with information across the trade book spectrum have real consumer appeal. With the support of the big publishers from the earliest possible moment to make the high-profile general trade books visible, at least a large portion of the discovery traffic could be liberated from being captive to Amazon, Google, or anybody else. And the consumer could be assured that the information she is getting on purchasing was being offered in her best interest, not based on what a retailer is trying to push. Worth noting: the ebook site Smashwords already sells ebooks at 15% margin, returning 85% of the publisher- or author-set retail price to the content owner. Up until now, Smashwords has been about author-generated ebooks; it has not pushed out an offer to publishers. And there are elements of Smashwords’s solution — DRM free, working from PDFs and doc files — that might not be exactly what publishers would want . But they might be the ebook solution, and it might be close to being in place. Smashwords may be the game-changer but the publishers and public haven’t discovered it yet.